The remains of a schooner called Flying Foam can still be seen at low tide, several hundred metres out to sea from Dale Road car park, as shown in the photo on the right by John Lawson-Reay. The Flying Foam, of Bridgwater, Somerset, was the last schooner to be wrecked in Conwy Bay. Built in St Malo, Jersey, in 1879, it weighed 200 tons and was powered by wind only (it was never fitted with auxiliary power). In January 1936 it anchored between Puffin Island and Penmaenmawr for repairs to a sail but was caught by a worsening westerly wind. The anchors dragged and the master, Captain Jackson, sent up distress signals. The Beaumaris lifeboat was launched and removed the crew of seven with the master and his wife. 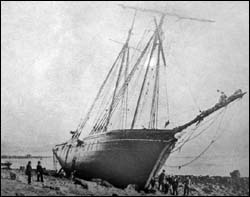 Local trawlermen later boarded the vessel while it was being driven ashore and tried to pump out the water from its hull, but the schooner grounded and began to break up. The wreck (pictured left) was sold to a local coal merchant, Owen Thomas, who removed the cargo with a horse and cart. Forty years earlier, on 8 October 1896, a schooner called Lady Agnes (pictured below right) had a lucky escape a little north of here. The vessel, of Newquay, Cornwall, was carrying codfish from Newfoundland to Liverpool when a north-easterly gale drove it onto the rocks below the ruined Bishop’s Palace, on the Great Orme. The sails were torn away. The captain, William Cox, and his crew of three lit distress flares at quarter-hour intervals through the night, the signals were not seen till daybreak. As the tide receded, the crew walked to safety. The schooner was refloated later, having sustained minimal damage, and worked for another 50 years, mainly carrying slates from Porthmadog, where it was scrapped in 1945.